Kona snorkeling can be a lot of fun! You can snorkel for hours in Hawaii, and it still wouldn't be enough to explore the deep, blue waters. When you plan a trip to the beach and feel a bit adventurous, snorkeling makes for the perfect fun activity. If you love the deep under-waters, but would like to feel safe and keep your adrenaline levels to a minimum, snorkeling in Kona might be the perfect activity that fits your needs. Swimming with a diving mask and breathing tube is the perfect way to have fun, at all ages. But if you're still looking for excuses to try this recreational activity, here are 5 reasons why Kona snorkeling is worth trying out. Typically, snorkeling equipment includes only 3 items. To go for a safe dive and swim alongside tropical fish, you'll only need a diving mask, a snorkel tube and swim fins. 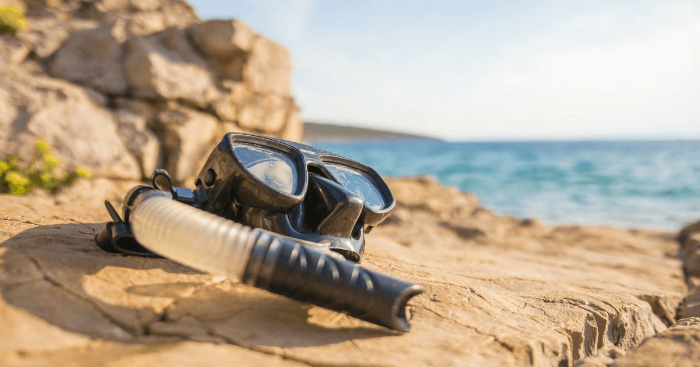 As opposed to other recreational diving activities, the cost of snorkeling equipment is significantly low. You don't need to buy expensive diving gear or pay for costly lessons to learn how to breathe through a snorkel. As already mentioned before, anyone in Hawaii can snorkel. From young children who are comfortable with water, to adults or seniors in search for fun, literally anyone can give Kona snorkeling a try. Certain safety precautions are important, of course, but swimming underwater in search for interesting sea life or flora is overall, a safe way to enjoy a day in the sun. And last, but not least, observe but do not touch! The Hawaii state fish with an unpronounceable name for non-locals, is one of the most unique sea creatures you can encounter. Also known as the reef triggerfish, the species can be found swimming through the coral reefs of the Pacific ocean. Another good reason to give Kona snorkeling a try is the fact that you can pack your whole equipment in one single backpack. As opposed to carrying heavy scuba diving gear, you can just toss your snorkel and mask in your beach bag. Don't forget though, if clothing is optional, you can even skip the bag and just carry your snorkel in your hand! If this is your first time snorkeling in Kona, you're in for an easy surprise. They always say that practice makes perfect, but snorkeling is easier than learning how to ride a bike. You'll only need a few short minutes to learn the correct way to breathe through a snorkel. And up next, the fun can begin! If you're confident enough to swim, you should be observing the corals up close in no time.